In Canada, there are four standalone Art and Design Universities. They are Emily Carr University of Art and Design in Vancouver, NSCAD University in Halifax, OCAD University in Toronto, and Alberta College of Art and Design in Calgary. Emily Carr university has the most active research program among the four with over 15 million dollars in research funding over the last five years. OCAD University's research intensity has reached 3.2 million dollars in 2011/12. All four schools teach in the major disciplines from painting through to new media and design. All four are public institutions with OCAD the largest followed by Emily Carr. Over the last five years, Emily Carr has garnered the most of the major awards for students and alums across the country. The most recent RBC Painting Competition was won by Vanessa Maltese, a graduate of OCAD University. OCAD has been very successful in the development of its graduate area with Emily Carr a close second. NSCAD has a long tradition of graduate teaching and learning. Art schools have a history in Sweden since the first half of the 18th Century. Students may attend the Royal Institute of Art, which got its start in 1735. Established in 1844 originally as a part-time art school for Sunday artisans, the University College of Arts, Crafts and Design known as "Konstfack" is an arts college offering bachelors and masters degrees in ceramics, glass, textiles, metalworking, and more. There are also tertiary art schools attached to universities in Gothenburg, Malmö and Umeå. Perhaps those generally felt most applicable to the definition of 'art school' are the autonomous colleges or schools of art offering courses across both further and higher education boundaries, of which there are approximately eighteen, under the banner of United Kingdom Art & Design Institutions Association. Others, whose existence ties in indelibly with that of larger, non-discipline-specific universities (such as the Slade School of Art) exist. Most art schools of either orientation are equipped to offer opportunities spanning from post-16 to postgraduate level. The range of colleges span from predominantly further education establishments to research-led specialist institutes. The University of the Arts London, for example, is a federally structured institution that comprises six previously independent schools situated in London. These include Camberwell College of Arts, Central Saint Martins College of Art and Design, Chelsea College of Art and Design, London College of Communication, London College of Fashion, and Wimbledon College of Art; others include The Slade School of Fine Art, The Royal College of Art and Goldsmiths College, University of London, which each grant undergraduate and postgraduate awards under one collegiate arm. The Royal College of Art with its degree-awarding arm and singular focus on postgraduate awards being a most singular exception. Outside of London Art Schools in the UK include Academy of Realist Art UK, Edinburgh College of Art, Hereford College of Arts, Duncan of Jordanstone College of Art & Design, Glasgow School of Art, Moray School of Art (University of the Highlands and Islands), Birmingham Institute of Art and Design, Coventry School of Art and Design, Norwich University of the Arts, Falmouth University, Plymouth College of Art and Design and Loughborough University School of Art and Design among others. Since the 1970s, degrees have replaced diplomas as the top-tier qualification in the field. In the case of wholly freestanding institutions, degree validation agreements in liaison with a university have long been the custom for Bachelor of Arts (Hons) level upward. There has been a general trend for all-encompassing universities to offer programs in the visual arts, and formerly independent art schools have merged with polytechnics and universities to offer such degrees. A notable exception to this is the City and Guilds of London Art School, an independent art school solely focused on fine art and related disciplines such as carving and conservation. A few art schools have taken on university status themselves, namely the aforementioned Royal College of Art and the University of the Arts London. Most specialist institutions in the United Kingdom can trace their histories back to the nineteenth century or beyond, originating usually from government initiatives. In April 2011 Modern Painters (magazine) surveyed art world professionals to create a list of the top 10 UK art schools which ranked them: 1. Royal College of Art, 2. Royal Academy Schools, 3. City and Guilds of London Art School, 4. Slade School of Art, 5. Goldsmiths College, University of London, 6. Glasgow School of Fine Art, 7. 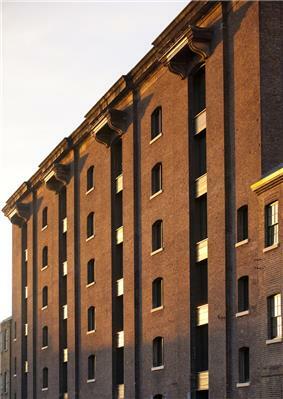 Central Saint Martins College of Art and Design, University of the Arts London, 8. Camberwell College of Arts, University of the Arts London, 9. Edinburgh College of Art and 10. Chelsea College of Art and Design, University of the Arts London. In the U.S., art and design schools that offer bachelor of fine arts or Master of Fine Arts degrees break down into basic types with some overlap and variations. The most highly rated schools belong to a consortium formed in 1991 and called the Association of Independent Colleges of Art and Design (AICAD). These schools differ from for-profit career schools in that they require a strong component of liberal arts courses in addition to art and design courses, providing a well-rounded college degree. There also are partnerships between art schools and universities such as School of the Art Institute of Chicago with Roosevelt University, the New England School of Art and Design at Suffolk University, Art Institute of Boston at Lesley University, the Rhode Island School of Design with Brown University, Maryland Institute College of Art and Johns Hopkins University, the School of the Museum of Fine Arts in conjunction with Tufts University, Tyler School of Art at Temple University, Parsons The New School for Design at The New School, or Herron School of Art at Indiana University. There is one state-supported independent art school in the U.S., Massachusetts College of Art and Design. 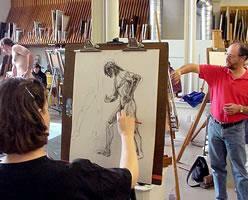 The first Art School in the U.S. is the Pennsylvania Academy of the Fine Arts (PAFA). Cooper Union in New York City is among the most selective of art schools, admitting 4%, with every student on full scholarship. The Yale School of Art at Yale University offers only graduate instruction in its two-year MFA programs. The Yale Daily News reported on Thursday, February 1, 2007 that the School had 1215 applications for its class of 2009 and would offer admission to fifty-five students. Next up the scale in size for an art school would be a large art or design department, school, or college at a university. If it is a college, such as the College of Design,  at Iowa State University typically, it would contain programs that teach studio art, graphic design, photography, architecture, landscape architecture, interior design, or interior architecture, as well as art, design, and architectural history areas. Sometimes these are simply the schools of art, architecture, and design such as those at the College of Fine and Applied Arts at the University of Illinois at Urbana-Champaign or the Yale School of Art. With over 3,000 students, VCU School of the Arts at Virginia Commonwealth University is one of the largest art schools in the nation and is also has achieved the highest ranking ever for a public university. Variation exists among art schools that are larger institutions, however, the essential element is that programs at universities tend to include more liberal arts courses and slightly less studio work, when compared to dedicated, but independent, schools of art. The final and most common type of art school, a state supported or private program, would be at a university or college. It typically is a BA program, but also might be a BFA, MA, or MFA. These programs tend to emphasize a more general degree in art and do not require a major in a specific field, but might offer concentrations. A concentration is not accepted by some accrediting or professional organizations as being adequate preparation in some fields that would lead to success as a professional. This is the case for graphic design, where typically, the minimal degree is a BFA major in graphic design. 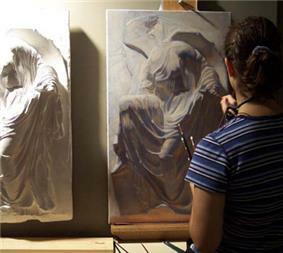 Many of the degree-offering institutions do not offer intense training in classical realism and academic painting and drawing. 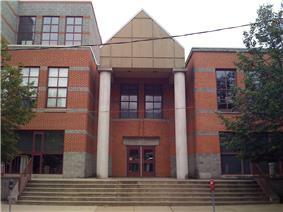 The Lyme Academy College of Fine Arts is considered a collegiate version of this educational model. 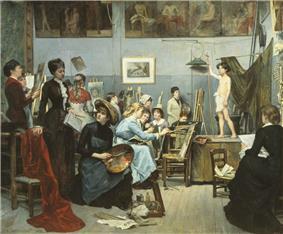 This gap is filled by Atelier art schools (schools located inside an artist's studio) or in separate locations, such as the New York Academy of Art, the National Academy of Design, the New York Studio School, the Pennsylvania Academy of the Fine Arts (PAFA), established 1805, the Art Students League of New York, established in 1875, and the Academy of Classical Design. In recent years a number of art schools have begun to offer some or all of their curricula online, which by nature, transcends national boundaries. Among these are The Art Institute of Pittsburgh Online and Academy of Art University. As with on-ground schools, many of the majors involve computer-based work, such as compositions created in Photoshop, Illustrator, or 3D-Studio Max. Submission and review of these materials proceeds virtually identically for on-ground and online classes. When online courses require production of traditional drawings or other such materials, they usually are photographed or scanned for submission and review by instructors. In contrast to the contemporary stereotype professional art and design education accredited by the National Association of Schools of Art and Design or offered by the members of the Association of Independent Colleges of Art and Design incorporates rigorous liberal arts and general education requirements so that students receive an authentic college or university degree. ^ "City and Guilds of London Art School - Modern Painters Survey Ranks School as 3rd Best UK Graduate Arts Programme". Cityandguildsartschool.ac.uk. Retrieved 2014-02-15. ^ "Virginia Commonwealth University Office of the Provost". Vcu.edu. 2013-11-19. Retrieved 2014-02-15. ^ "VCUarts - Virginia Commonwealth University School of the Arts". Arts.vcu.edu. 2011-08-15. Retrieved 2014-02-15.